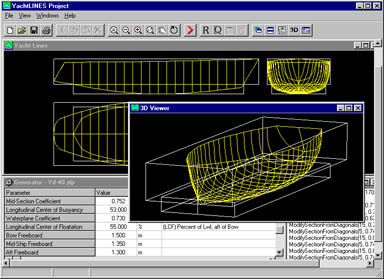 YachtLINES is a parametric hull surface generator for yacht forms. It follows the parametric hull generation approach in the traditional manner using parameters to control dimensions and hydrostatic properties. The dimensional data is used to create longitudinal form curves such as the profile, deck and waterline shape. The longitudinal form curves are used to create sections, starting first with the midship section, the section at the aft perpendicular and subsequently the sections at the quarters. These four sections are used with the profile to fit three curves equivalent to the traditional diagonal curves found on lines plan from which the remaining sections will be generated to create a total of 21 sections. The displacement and centroid of the hull form can be obtained be calculating the underwater area of each section. Subsequently, the shape of the hull form is modified iteratively by adjusting the section curves at the hull quarters until the specified displacement and longitudinal centre of buoyancy specified by the initial parameters is achieved. Once a set of hull sections conforming to the initial parameters is obtained a B-Spline hull surface is fitted to the results. The first version of the YachtLINES is available from the downloads section of this website along with the Delphi Source code. As a result of the development of IntelliHull, the YachtLINES code was updated to incorporate bracketing into the iteration procedures. Bracketing is where minimum and maximum limits are placed on iterative search to prevent it searching inappropriate areas of the parameter space. The updated version of YachtLINES is available in PolyCAD 7.0 onwards. An illustrative example of the use of the YachtLINES surface in PolyCAD is shown in this demonstration.